Software developers regard change requests as either cost burdens, or profit opportunities. Steve Cotterell looks at a system designed to help you reduce costs and maximise profitability. A Web-based enterprise change management system that can be configured to ensure conformity to ITIL, or whatever other business process your organisation deems appropriate in the circumstances – including home-grown processes. There’s an old French proverb that goes: Plus ça change, plus c’est la meme chose (The more things change, the more they’re the same.) But then the old French had never heard of computers and never had to wrestle with the results of change requests in a software development environment. Maybe the more appropriate proverb now is: Those whom the Gods wish to destroy they first make mad! But don’t despair! Intasoft has developed a tool that may well help you cling to the last vestiges of sanity. IntaChange is a Web-based change management application that runs in the client’s browser (Internet Explorer Version 6 or later) without requiring any additional software. The application has been built using Microsoft .Net technology. If you already run an enterprise SQL Server database, IntaChange will integrate with it and you’ll gain the additional benefits of being able to schedule jobs and reports. However, those without SQL Server can use the free, built-in MSDE system. To use IntaChange, you log in with your name and password (the system uses role-based security) and select the project to work with. If you experience difficulty logging in, you can email the system administrator directly from the log in screen. Each project is set up using a template. There’s a set of templates supplied with IntaChange, including an ITIL template and two devised by Intasoft, standard and basic. All the templates have built in statuses and rules and all can be copied and amended. The system opens at your personal ‘Main’ page, which is where the majority of users do most of their work. This screen is divided, by tabs, into pages. The ‘Main’ page has been already mentioned, and we’ll return to it in a moment. There’s a ‘Reports’ page, a ‘Personal Preferences’ page (where you personalise your system) and also ‘Logoff’ and ‘Help’ pages. The System Administrator has access to two additional pages – ‘Integrations’ and ‘Admin’. Many administration tasks are done using wizards, making them quick and easy. The Main page ‘Browser’ displays a list of the Requests for Change (RFCs) logged against the project, along with status and some other basic information (configurable via Personal Preferences). In addition to the list format, the RFCs can be displayed on a calendar logging each RFC against any date you want (possibly the task start date or the scheduled implementation date). The dates displayed can be coloured according to the data in another field (for example, priority). Using this calendar display and filtering the data, you can see, month by month, the status of your workload. Pointing the mouse at one of the entries on the calendar causes a ‘tool tip’ to display a summary of information about the RFC. In the list view, IntaChange has a pre-defined list of filters built in. This list was compiled following research involving both customers and other third parties and Intasoft believes it to be fairly comprehensive. However, if necessary, you can build your own filter using the ‘Custom Filter Picker’- but you can’t save a filter so built for future use. This function will, I am assured, be included in the next version. At the foot of the screen is a ‘Viewer’ in which can be displayed detailed information about a RFC highlighted in the upper portion of the screen. The Viewer is also used to enter new RFCs and you can copy a RFC and edit it to produce a new one. The Viewer is divided into ‘Envelopes’, record cards that can each be tailored to display a specific set of information about the RFC. When setting up an Envelope, you can create as many fields to display as you like. You can display, for example, details of the process the RFC has to go through, its priority, the name of the RFC owner and the name and details of the people assigned to handle it. Within a project you can have as many change classes as you like and the class that you allocate to a RFC can be used to determine the layout of the Viewer, so you can have a different layout for each change class. Fields can be made mandatory and can be locked once the RFC’s been approved. IntaChange can be interfaced with Microsoft Exchange so that a value in an IntaChange field can be used to look up the full contact details that are held in Exchange. An individual’s entry in Exchange can be linked to a set of fields in Intachange or they can be copied in (in which case they won’t be updated when the Exchange record is amended). A Priority Envelope may include details (automatically calculated according to rules you lay down) of the route through the process the RFC takes. Date and time fields can be specified – possibly for implementation of the change. Effort can be estimated and a percent complete field can be included. You can specify what teams are to be involved and who’s in each team. You can define how alerts go to these people advising them of their assignment to a team of developers, approvers, testers and so on. 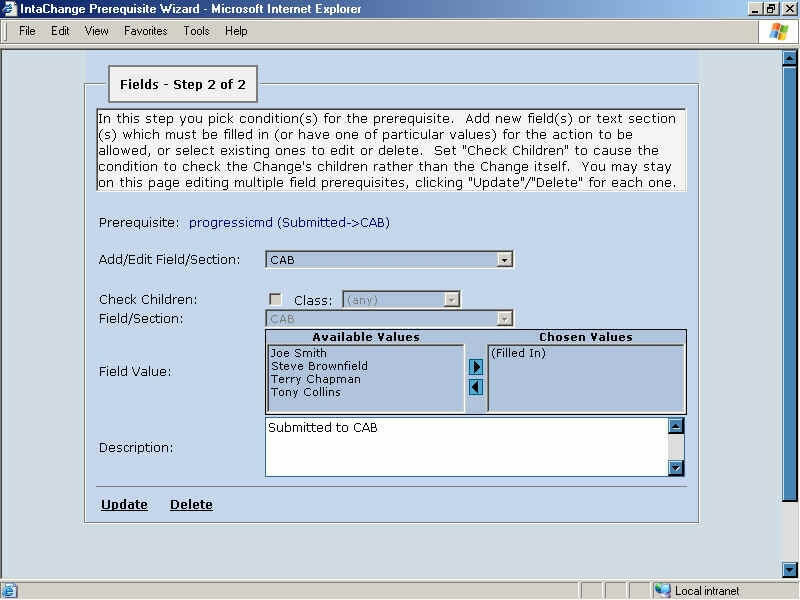 Free text fields can be set up (including a spell checker) to hold pre-defined types of information – for example the change description, implementation plans, etc. You can make provision for a threaded discussion about each topic with an audit trail being preserved. The lifecycle process can be reflected in the headings under which free text can be posted. The system can then be configured to confirm that text has been entered against any heading – in much the same way as you would check that fields on a form had been completed. Beside each field, everywhere in the system, is a little pen and paper icon. Click on it and you can attach your own comment to a field. You can automatically notify other people by email that you’ve added a comment. The Browser view can be changed so that comments added to a particular RFC can be displayed, browsed and acted upon. You can configure this view to display filtered lists of comments from all RFCs in the system and you can establish processes to determine when and who can close comments. In every browser display, data can be sorted by column heading just by clicking on the appropriate heading. External files can be attached to a RFC – but no viewers are included, so you need an external viewer (or the originating application) on the machine that you are using. You can add a comment to explain why the document is attached. The system administrator can limit the size of attachments (which are imported into the SQL database) permitted. RFCs can be cross referenced to as many other RFCs as you like and parent and child relationships between RFCs can be established. An audit trail is maintained of every change in every field in every RFC. The Audit Trail database can be filtered and searched to find specific changes to specific fields. At the foot of the screen is an ‘Update’ button. No changes are committed to the database until you click the Update button or move to another screen. There’s also a RFC ‘Delete’ button, which can be disabled by the system administrator. Next to these buttons are shown the next actions available in the highlighted RFC’s lifecycle process – for example: Review, Reject, Close, etc. If someone without the appropriate rights tries to do something that they’re not supposed to, they see a message explaining why they can’t do it, and who can. The help system contains flowcharts illustrating the templated processes supplied with the system. If you decide that you want to progress the RFC to the next lifecycle stage, you click the appropriate action in the list. If you’ve completed all the appropriate fields, the RFC moves forward to the next stage. If you haven’t, you see a message explaining what still needs to be done. You can define, in your business process, that a vote is required before a RFC can move from one point to the next. It enforces the process in that decisions must be made by the appropriate people before the next action option becomes available and can be used to record decisions made by just one person. A voting icon appears at the foot of the screen; click on it and you open a voting dialog where you cast your vote, giving a reason for voting that way. You can set up as many votes as you want – either by individuals or roles and the system will wait until all votes have been cast. You can set deadlines and can escalate if not all votes are in by a specified deadline. You can configure a decision to require a unanimous vote, a majority vote, 3 out of 5, etc. Once the vote has been completed, the option that won becomes available at the foot of the screen. You can also have an advisory vote (what do you think we should do?) which you can ignore if you want to. The system keeps an audit trail of the decisions made and the votes database can be browsed, filtered and searched. At present IntaChange, as supplied, can be integrated with Microsoft Project and Exchange and Intasoft AllChange. Other integrations can be supplied at additional cost or, if able, you can add your own. Release 2 will also be able to integrate with Infopath (Microsoft’s form design application) and the LDAP (common address protocol) interface. When set up, Microsoft Project will have been given global configurations, including resource names. To create an IntaChange integration, you create an empty project, without tasks or resources, name and save it. You then give IntaChange information about the project name and of the Project system setup (the database name, etc.). You can link IntaChange and Project so that changes in one can be transferred to the other. The administrator has to map Intachange fields to Project fields (unless you make changes, this only has to be done once, at set up). If you’re using one of the templates supplied with the system, the fields will have already been mapped. 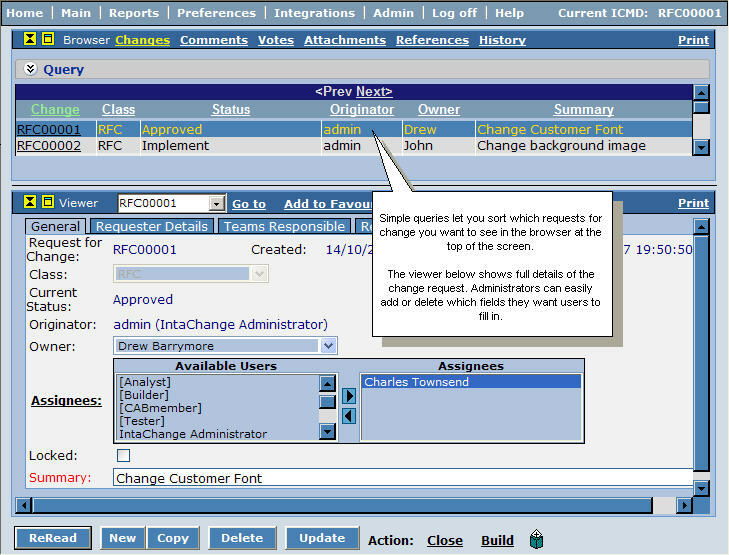 Any user-defined IntaChange fields have to be mapped to the appropriate field in Project (if there is one). There are a number of fields in Project that the user can rename and use for their own purpose. Due to the way the Intasoft/Project integration has been set up, you can’t map data to these fields. I’m assured that, in version 2.0, all of Project’s user-definable fields will be included as part of the data mapping between the two products. IntaChange exports each RFC as a single task into Project. Thereafter, it’s up to the planner to flesh out the actions in Project below each RFC task. You decide which is the master application (to decide which way the data is transferred after the initial creation of the Project tasks by IntaChange). If, thereafter, resources are assigned in Project, on synchronisation IntaChange will pick this up and email the resources with assignment details. In order for either application to pick up resource allocation in the other, the resources must already exist in both applications’ databases. Emails can include information about times, dates etc. and can be made almost as informative as you like. Emails can be hooked to changes in a wide selection of fields. Early in this review I mentioned that IntaChange comes with three project templates. However, creating the definition of a new template doesn’t involve rocket science! You state what your organisation calls a RFC and define as many different types of changes as you need. Then, using a Wizard, you define the headings used by the Free Text section of the Main Screen. The Wizard then takes you through creating a business process lifecycle for your RFCs. You can use an existing process, or create a new one. You define the name of each stage in the lifecycle, add a description and set up the progression rules from one status to the next. You define if and who you want to assign to the job and whom you want emailed. Using a Wizard, you then set up the ‘Prerequisites’, the business rules that govern your progression through the lifecycle. For example, which fields must be completed before moving from one state to the next. You can create and save as many templates as you need. There’s a selection of report templates included in IntaChange, based on clients’ actual reports. You can edit templates and add your own new reports which can be saved and used as templates. Reports can be output to HTML, PDF, Word, Excel and RTF file format. Runtime Crystal Reports is embedded in the product, as is Microsoft SQL Reporting Services. You can edit Crystal Reports templates if you have the ability and knowledge. Even if you can’t, you can select the fields to be reported on and set the criteria to your own needs. To date, clients haven’t needed to use Intasoft implementation services as, by the time they buy the product, they have been shown how it works as part of the sales process. However, training consultancy would be available should a user require it. The relevance of combining change management with project management is not always well appreciated. At Intasoft, we spent two years researching the needs of the project manager at all levels within all kinds of organisation and believe that the integration with Microsoft Project, is the first step in the right direction. If you can save time and effort you inevitably reduce costs and increase profit and productivity. We believe the integration does just that by allowing plans to be generated from information already recorded in the change management database and by providing the ability for project managers to directly update change information simply by altering their plans. Out of the box templates are designed to make the process even easier but are easily changed to meet specific requirements. There is always room for improvement and we have already taken on board the comments made in this review for version 2.0 of the software. This is no special effort done just because of the review. We do exactly the same for any comments anyone makes about our software. As existing customers have found, if you need something that is not already covered all you have to do is ask.